Eating right when you're sick is especially important and just like with humans, finding the right foods for your dog when he's ill can be challenging. When your dog is suffering from inflamed joints the impact from what he eats is apparent, crucial and essential for his long-term care. 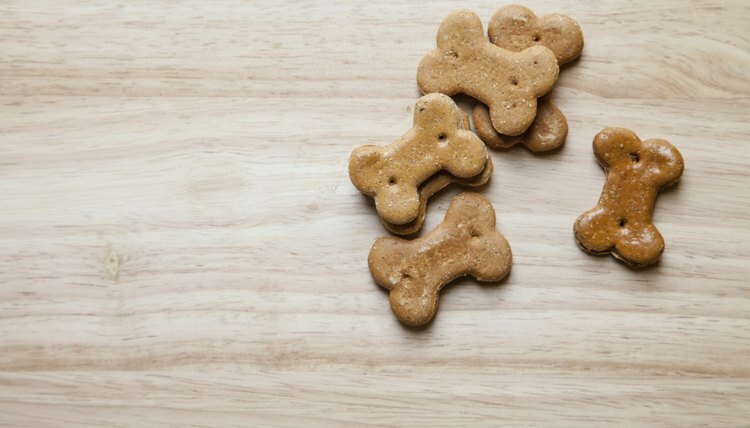 The inflammation causing accumulation of fluids around your dog's bone joints can come from a variety of veterinary issues including degenerative osteoarthritis, a localized injury, blood clot abnormalities, tumors, systemic polyarthritis disease, bacterial infection or is breed specific. Canine joint effusion, or swelling, causes pain and can lead to long-term illness or deformity. Whenever you wish to change your dog's diet, it is important to consult his veterinarian. Several commercial prescription recipes dedicated to relieve joint swelling in your dog are available. Since the swelling of your dog's joints predicates cartilage destruction, prescription diets for joint inflammation use natural glucosamine and chondroitin as building blocks for healthy joint cartilage. A serious consideration when thinking about an anti-inflammatory diet for your dog is meeting his nutritional requirements. The first and most prominent ingredient in any dog's diet should be protein. Lean protein with omega-3 fatty acids such as chicken, and fish, including sardines and salmon, are among the strongest anti-inflammatory foods. According to the administration at the Natural Home Remedies Site, research into what foods have an anti-inflammatory effect on dog joints is based on the same science conducted on people. In accordance to such data, an anti-inflammatory canine diet includes vegetables like sweet potatoes, butternut squash, broccoli, spinach, kale and fruits such as mango, pineapple and papaya. Adding herbal and natural supplements to your dog's food is based on his size and the extent of his joint inflammation. Since dogs afflicted with joint inflammation show relief from foods containing omega-3 fatty acids, adding fish oil to his diet helps. Liquorice, used as an oil infusion, is a popular natural anti-inflammatory dietary addition with few known side effects. St John’s wort relieves joint and nerve pain and a tincture, combined with skullcap, is often used for canine swollen joint pain relief. Turmeric has anti-inflammatory properties close to cortisone, and dog owners use this dried spice by sprinkling it onto their dog's food. Almost as important as anti-inflammatory foods are for dogs with joint inflammation, are foods that are definite no-nos. Foods that exacerbate joint inflammation include those with omega-6 fatty acids. Foods containing linoleic acid and gamma linoleic, such as the fat found in corn oil, should be avoided. These foods have a catalytic effect to the inflammatory chemicals naturally occurring in your dog's body. Many grains are considered pro-inflammatory and grain-free diets prove beneficial for dogs suffering with inflamed joints. Many nonprescription commercial pet foods contain an unhealthy imbalance of omega-6 fatty acids, leaving common store bought foods for dog's with joint ailments, undesirable.